I've wanted a home office for the longest time. Somewhere I can sit and relax to write my blog posts and edit photos; an inspiring little hub filled with my favourite things. At long last, I've managed to achieve my dreams! It's been a work in progress for the past month or so, but I'm finally at a point where I can share it on here. I've had to censor the artwork on the walls because of copyright. I know that sounds ridiculously pompous but, honestly, it's not worth the risk of getting in trouble! 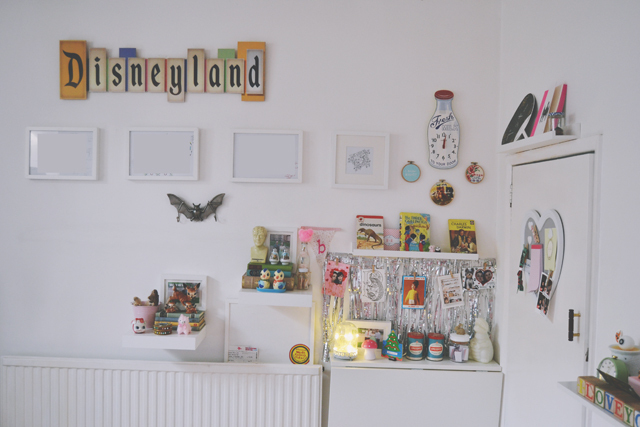 The Disneyland sign was a wedding present bought in Florida, the milk bottle clock is from TK Maxx, embroidery hoops from Etsy and the bat hook was bought in Debenhams. I'm going to hang my calendar from it. 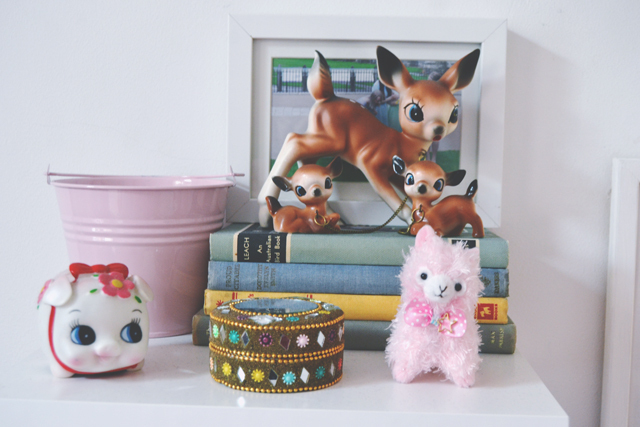 The lower shelf is the home of my 1950s piggy bank, although I can't remember where I got it from, and my little cuddly alpaca. The fawns are from a local charity shop, as are the vintage hardbacks, which were used as decorations for our wedding. I bought the tin bucket on eBay to use as a pen pot but, when it turned up, it was far too big. One of the children in my class bought me the trinket box from a market when he visited his family in Pakistan. My teaching assistant, who is also Pakistani, told me that these boxes are all handmade for sale. It smells amazing, with heady scents of patchouli and sandalwood that linger from the marketplace. The second shelf is my favourite. Again, it has vintage hardbacks stacked up, although the bottom book is actually a storage box from TK Maxx, in which I keep my Post It notes. I bought the little phrenology head at the same time. I've wanted one for ages, and this cute little one was just perfect! For some reason, I have a thing about kitschy salt and pepper shakers, so there are two on this shelf. 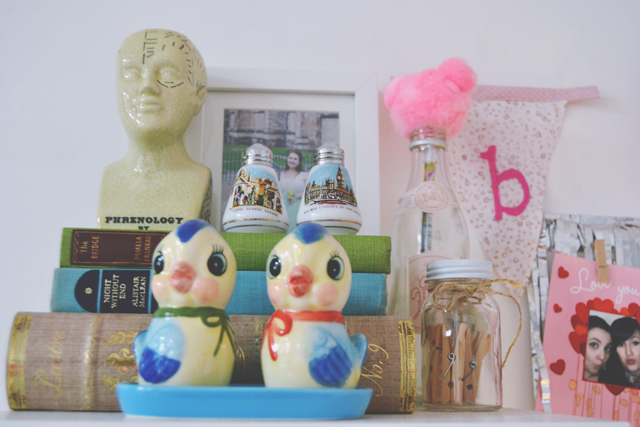 The birds are from Urban Outfitters, but the smaller ones above are 1960s London souvenirs that I picked up at a vintage market. The pink lemonade bottle from Bill's holds this cute fluffy Mickey pen from Magic Kingdom. I was very kindly sent this bell jar by DotComGiftShop. 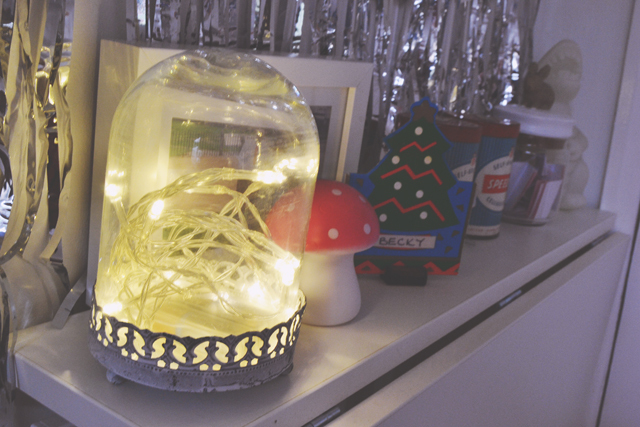 It's the perfect size for perching on my Ikea drop-leaf table and holds these fairy lights for a really pretty effect. Handily, it's super easy to place things inside. The glass bell simply lifts up, so I can place whatever I want to display on the distressed metal tray below and then carefully position the jar back in place. 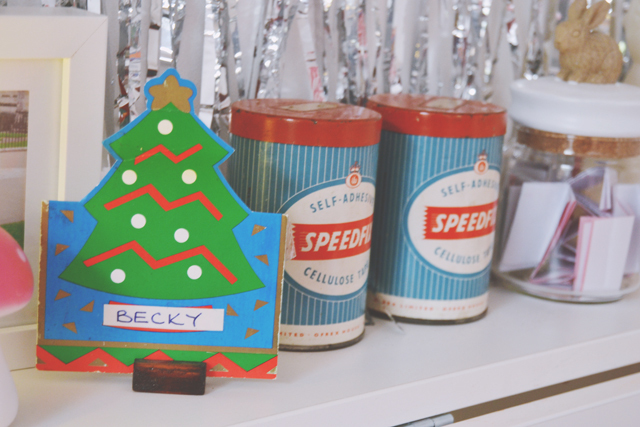 The Christmas nametag is my favourite thing and it will live on my desk all year round. Every year, since before I can remember, the whole family would visit my grandparents' house every Christmas. My grandad made the most amazing Christmas dinner, and everybody had these little Christmas placenames. I keep this on my desk as a little memento of my grandad and the wonderful Christmases we had. I knew that I was absolutely going to have a silver tinsel curtain, and I love the way it looks. It's the perfect kitschy backdrop for my desk. 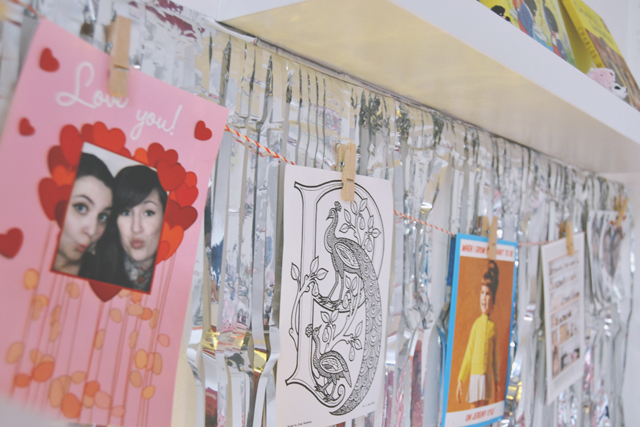 I've used some red striped twine and mini pegs to hang up a small selection of postcards, greetings cards, and photobooth pictures of me and Leona. 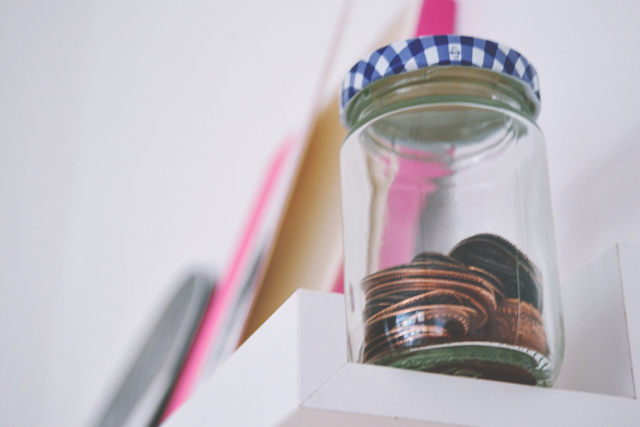 Above my cupboard is an Ikea picture shelf where I keep my jar of pressed pennies. I'm hoping to fill it right up over time. As my office is in the corner of our living room, and therefore doesn't have much space, I bought a folding chair from Ikea and hang it from hooks inside the cupboard. Unfortunately, it's very uncomfortable! 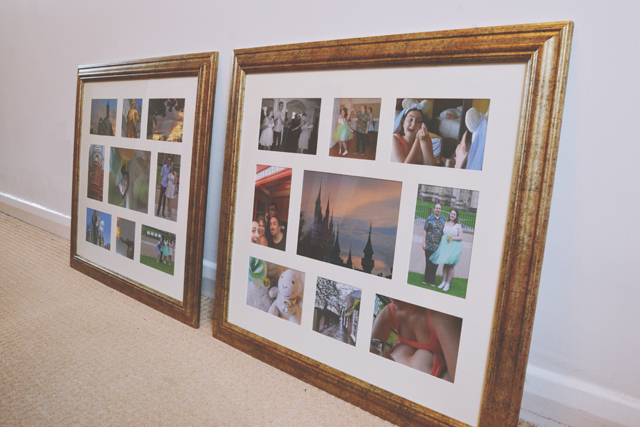 These photo frames are from Museum Selection and are perfect for displaying my wedding photos. 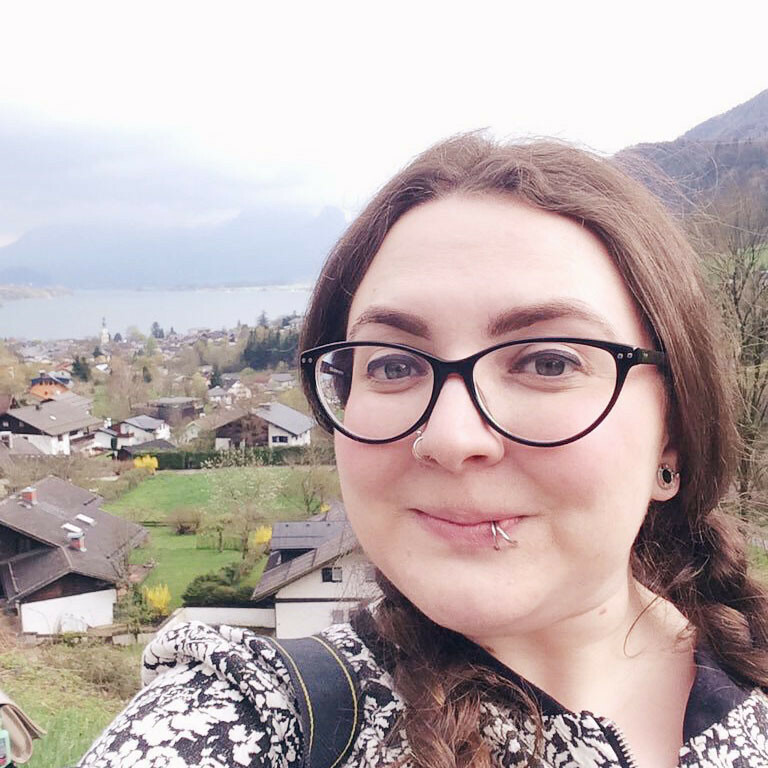 I love the varied sizes of the windows, and I spent forever organising and re-organising my photos to get the perfect combination. 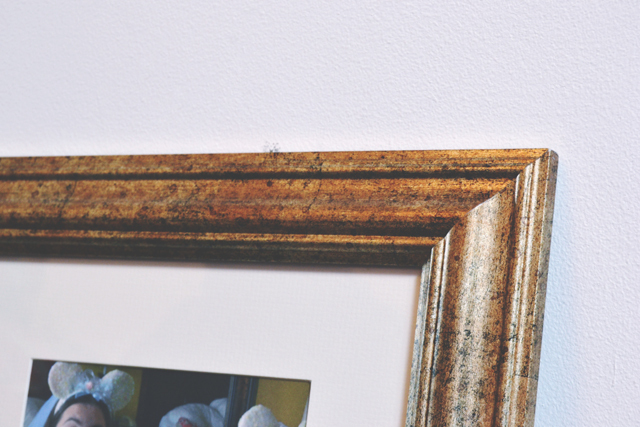 The frame has an antique gold gilded effect, which creates a lovely feeling of luxury. I think they look gorgeous! There we have it! My long-awaited, but very highly-desired, home office. 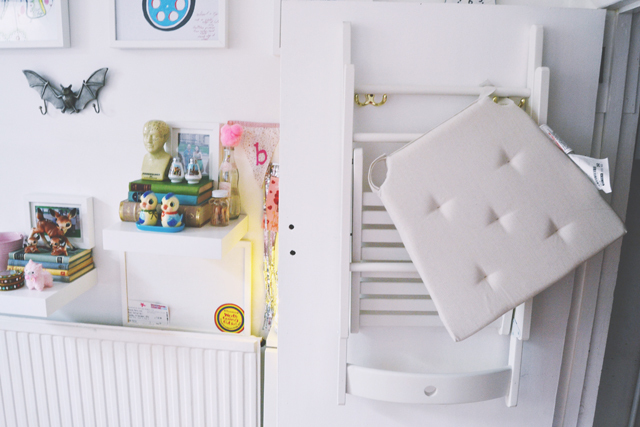 I could not be happier with it, although I do have some future plans for the living room so keep your eyes peeled! Thank you! My spare room is my dumping ground for clothes haha. Hopefully I'll be able to clear that out one day. Your office space is adorable! I particularly love the milk bottle clock, and all of the little vintage trinkets, especially the deer! Thank you! I'm really happy with it! i love it! i did a blog post awhile ago about my "office" area. I love it so much and its so nice looking at it while i blog. lol. I do the same thing with mine haha! 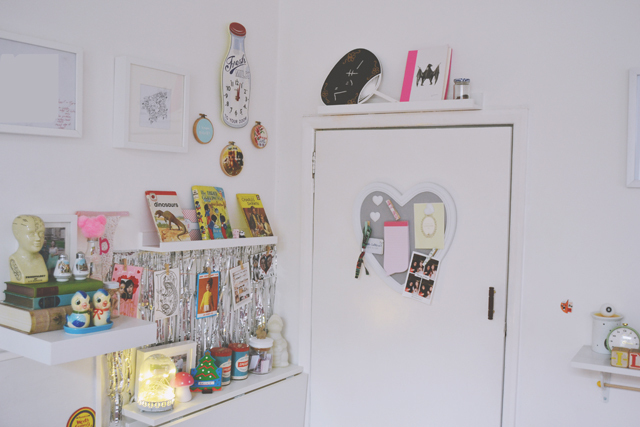 Awww your desk space is so cute! I love the fawns I really want them! May have to go snooping in a few charity shops! Good luck! I hope you find some nice things! I'm the opposite- I like everything to be around me haha. Yours sounds really cute! That's such a cute way of putting it! 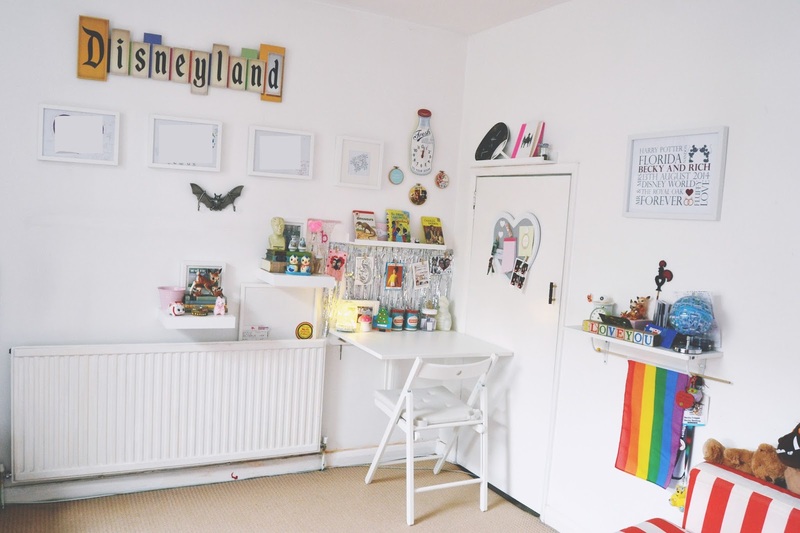 It's definitely a cute space! I'm starting to think my desk space is so so boring in comparison. It's a desk, with hardly anything on and sits behind the breakfast bar thing of the kitchen. We have a very strange home layout! I know this is old and you've probably changed it a lot but I love looking around peoples houses! I always wanted to be Lloyd Grossman on Through the Keyhole!